Juicy watermelon packs a big punch of flavor. With just the right amount of tartness and sweet, it is often described as being similar to a those "happy farmer" hard candies. A favorite for sweet lovers. 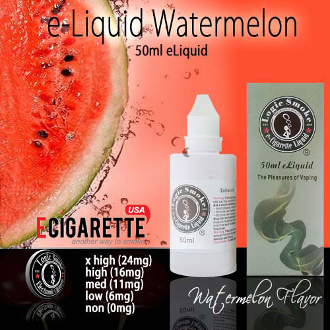 Great all by itself or mixed with a number of our other Logic Smoke e-liquid flavors. Try mixing with peach, strawberry, red raspberry or blackberry to add an even fruitier twist to your mix. With the perfect blend of an 80/20 PG/VG mix (propylene glycol and vegetable glycerin: organic, food grade preservative compounds), you'll get the best flavor concentration along with the perfect amount of vapor to satisfy your vaping needs.